Will be released once Crimes Against Nature Special Edition is officially done! What would be the console command base ID I would input to bring her to me? If you wish to not have the code known to everyone, a private message would work for me as well. Huh... is there a loose files version? I always love to mess with stuff. ...Why? Looks funny as hell, I won't lie, but still. 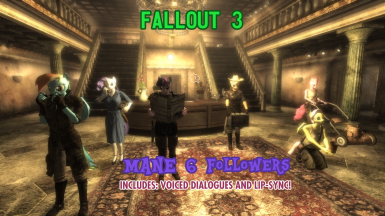 It just feels wrong to mix something as beautiful, pure and wholesome as Fallout with ponies. Geez kid, stop crying. It's just an obscure mod on the internet, we all have to deal with it. Is there a way to assign them a home? Or do I have to go back to their original places in order to switch around? No, there isn't unfortunately. You'll need to go back to their original homes to recruit them. 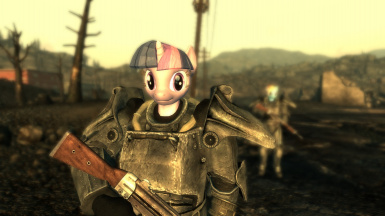 Make sure you actually installed Crimes Against the Wasteland properly. Could of done them as creature companion's in their full pony form. Yeah, but then they wouldn't be able to hold weapons, wear armor, or have facial animations. 10/10 Where the f*** is Pinkie? In a magic place. It's called a description. So it is, you win this round. It truly is the best immersion. Gopher would be so proud.